Could the Spyderco Sage 1 be the perfect stealth EDC knife / gentleman’s folder? The Spyderco Sage line is a series of very well produced knives, each one with a different locking system, honoring the designer of that locking system. That aside, what matters to the end user is immaculate fit & finish, great quality, and a nice overall folding knife that actually works, that you can depend on. This is a solid and capable knife, but also beautiful designed and built. As such, it’s also an excellent gentleman’s folder. A very, very usable 3 inch blade with lots of belly, for great cutting performance. 50%/5o% choil at the start of the blade, allowing you to “choke up” on the blade for very fine precision use. Having used a knife with this type of finger choil extensively, I strongly prefer it for most to a full edge. This choil also protects your fingers in case the liner lock accidentally disengages. Beautiful construction, excellent quality, perfect fit and finish. Stealth, deep carry wire tension clip that keeps most of your knife out of sight. Love this clip, wish it came standard on all Spyderco knives instead of the garish in-your-face monster clip that puts a third of your knife on display outside the pocket. Open back and full flow-through construction makes it very easy to keep clean. The Spyderco Sage 1 is an absolutely amazing EDC knife. Amazing quality, perfect fit and finish, great blade size and shape, great steel, excellent grip provided by the nicely textured carbon fiber scales, stealth, deep carry tension wire clip, all in a beautiful package. Blade length and handle size are neither too big nor too small… just right. The only gotcha to be aware of… if this is your first Spyderco knife, it will make you want more of their knives! Get one, you won’t regret it. 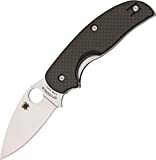 Get the Spyderco Sage 1 from Amazon here. If you’re looking for something substantially bigger and more solid, but still very high end, I highly recommend the legendary Spyderco Military. For a closer look, here are some of the best video reviews of this knife.